There are a few typical interview questions that hiring managers just LOVE to ask. And you need to be ready for them, because they usually come at the start of the interview and set the tone for the entire conversation. 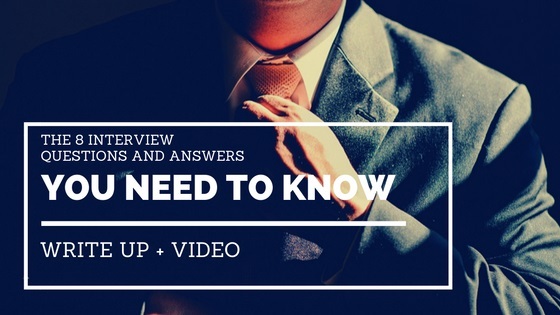 For each question, I’ve put simple instructions on what the hiring manager wants to hear, a video, and a link to a full article if you want more info on one of these interview questions and answers. Step 1. Figure out what the company wants/needs most. 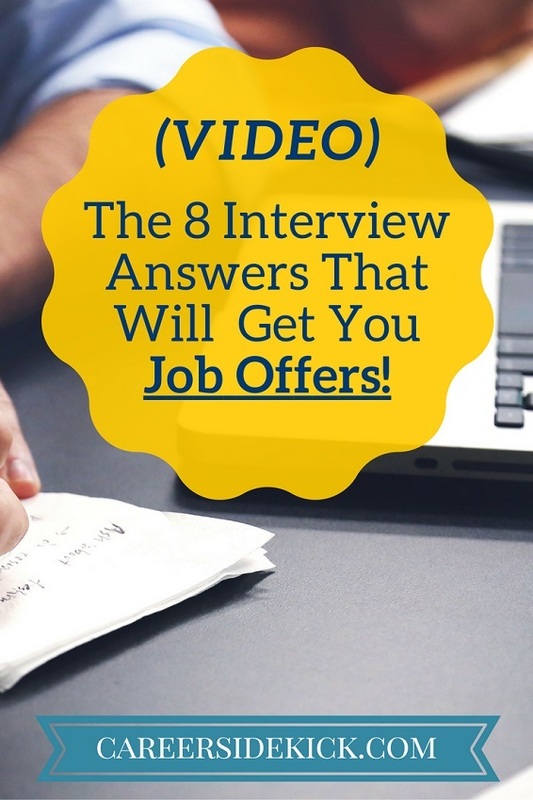 If you want to get hired for a good job, you need to make your interview answers about THEM, not you. The fastest and easiest way to know what they need is to look at the job description. What do they mention most often? What is emphasized near the top or mentioned first? Step 2. Now that you know what they want for this job opening, you need to give it to them. You should tell them that you did some research, mention what you noticed about the job’s requirements, and then highlight your skills and experience that fit best with what they need! Give specific examples if you can. Tell them how many people you led, what topics you guided them on, what you learned as a leader. And then remember to show that you’re interested in leading, or that you enjoy it as well! It’s important to show that you WANT to be doing the type of work they need. Being able to do something doesn’t mean you’ll necessarily be interested, motivated and happy in the job. To put their mind at ease you need to show excitement and a genuine interest in working with the areas you’re talking about! Never bad-mouth your former company. It’ll immediately make the interviewer wonder if you were the reason the problem occurred. So I like to use a strategy I call “More Of”… It’s a trick I use to turn negatives into positives. You do this by saying you changed jobs or left your past job to get more of something. Instead of saying “my last job didn’t give me enough chance to lead” (which sounds negative), you’d say, “I wanted more of a chance to lead”. Just fill in the blank with what you want more of in your next position. Leadership. Technical challenges. Teamwork and cooperation. Opportunity to learn a new area. Project management. More interaction with clients. Etc. And this is crucial: make sure whatever you say you want more of is something this company offers! Don’t say you want more project management if you won’t be managing any projects in this new job. Why would they hire you? They’ll think you won’t enjoy it and won’t stay for long enough to be worth hiring! Taking responsibility doesn’t mean you have to say everything was your fault. I get it- sometimes you join a bad company. I was fired in the past and the company was AWFUL. But companies want to hear you take accountability. So look for one or two things you could have done differently, and take responsibility for that piece. Why don’t I recommend just lying? Hiring managers are great at telling when you’re lying. And they might even ask for references before hiring you. So lying and saying you left your last job on your own, when you were actually fired, is probably going to end badly! And if they find out AFTER you’re hired that you lied, it can be grounds for termination. That’ll be two firings in a row and VERY hard to recover from, so use the method above. You’ll be fine. Everyone makes mistakes (or joins bad companies), and a reasonable hiring manager will see that you’re taking responsibility, being honest and upfront, and will want you on their team! Forget the cliche answers like “I’m such a hard worker that sometimes I just have trouble turning it off.” Hiring managers have heard them all a TON and will not be impressed. 1. Always choose something skill-based, not personality-based. 2. Talk about what you’re doing to overcome this weakness. This is going to impress them because you’re showing your approach to solving problems or overcoming challenges. That tells them you’ll do a great job if new challenges come up in this next job, or if they ask you to learn new things. 4. What can you tell me about yourself? This is one of the most common typical interview questions. It’s very open-ended but that doesn’t mean there aren’t bad answers. In general you want to walk them through your career and bring them up to speed on your current situation (what you did in your last job, why you’re job searching now, and what you’re looking for). If you’re a recent grad, start your story at the beginning of your college/university education and why you chose your field of study. If you have a few years of experience, you can start with the moment you graduated. From the starting point, walk them through significant pieces of your career, like big projects, companies you worked with, challenges and learning opportunities, and the reasons you changed from one company to the next. Keep everything under three minutes! They want you to be concise and stay on track. Do not get sidetracked no matter what. This is one of those interview answers you NEED to practice at home. I suggest you write down some bullet points and make sure you’re hitting the key topics as you tell your story. And time yourself to see if you finish in under three minutes. First, you need to be able to explain YOUR priorities and goals. You need to know one or two things that are important to you in your job search. Other than “I want to get hired” or “I’m unemployed so I need a job”. Then show them that you’ve researched the job and know what it involves. Finally, talk about how the things this job offers fit nicely with what you prioritized in your job hunt! And for an added bonus, talk about how you’d be effective in this area. Have you done anything in the past that’ll help you succeed? What skills and experience will allow you to come in and have an immediate impact. That’s what they want. Get specific, give examples. This is one of the tougher typical interview questions you’ll face, but answering doesn’t have to be difficult. First thing to realize- you don’t have to really know where you’ll be in five years. Who does, really? You just have to show that you’ve thought about it. You need to seem goal-oriented, and like you care about your career. And then you need to make sure that what you say fits with the job you’re interviewing for. It’s going to kill your chances of getting hired if you say your five year goal is something unrelated to the job you’re interviewing for. Why would they hire you if this job is taking you AWAY from your goals? They’ll be worried you’ll hate it and leave within the first year. Finally, make sure you pick a goal that’s slightly ambitious! Don’t say you hope to doing the same thing in five years. If you want to get hired you’re going to have to convince them you’re motivated to learn and advance. Whether or not it’s true, you need to talk the talk. This question trips a lot of people up because usually your dream job isn’t exactly the job you’re interviewing for (for a lucky few, maybe it is). So are you supposed to say that this job is your dream job? No! you don’t have to lie. Here’s what to do: Instead of saying a job title in your answer, just DESCRIBE what your dream job looks like. Talk about what qualities would make a job exciting to you. And make sure you’re tailoring your answer to what this company offers! Again, you don’t have to lie… just think about making sure your answer isn’t opposite to what this job involves. Never use a specific job title. Use words that describe what your dream job would look like. Choose at least two phrases or words, and pick things related to the job you’re interviewing for. Finish by showing the interviewer that you did some research about them, and explain why you’re interested in their job. 8. What are your greatest strengths? First, know what you’re going to say ahead of time. Do NOT just go in and “wing it.” Even preparing a half-decent answer will be better than making it up on the spot. This is one of those typical interview questions that you need to prepare for ahead of time. And keep your answer to one or two strengths. It’ll make the next steps easier and reduce the chance of you making a mistake. Always tailor your answer for the job. Make sure you choose strengths that fit with what you’ll be doing in this job. If the job involves working with customers and cooperating with a large team, why are they going to hire you if you say your greatest strength is working alone? So look at the job description and take five minutes to figure out what the company needs before deciding which strengths you’ll share. Most job seekers don’t know this: giving a detailed example with stats and facts is 10-20 times more powerful than just saying you have experience with something. So for your strengths, be sure to mention some facts and examples to back up your claim. Include specific numbers if you can.